Every day, Watch This offers staff recommendations inspired by a new movie coming out that week. This week: With both Gone Girl and Left Behind opening in theaters, we look back on other adaptations of books that went to No. 1 on The New York Times Best Seller list. The rare Stephen King adaptation to capture the author’s signature sense of inexplicable, internal/external terror, The Dead Zone stands as one of David Cronenberg’s most straightforward and eerily effective early works. Trimming King’s source material down to its lean essence—and benefiting from the lack of his imaginative monsters, which never properly translate to the screen—the film concerns Maine schoolteacher Johnny Smith (Christopher Walken), who turns down an offer to stay the night with his girlfriend Sarah (Brooke Adams), subsequently gets into a traffic accident, and awakens from a coma five years later with the gift of second sight. Far from a blessing, however, the power proves to be a damnable curse, turning Johnny into a freak show whose time and attention is coveted by many, but only for their own selfish ends. As the man’s vision expands, his life shrinks down to nothing—an isolated existence which Cronenberg depicts through direction that routinely lingers on the empty silences between words and the distant whooshing of wintry New England wind. 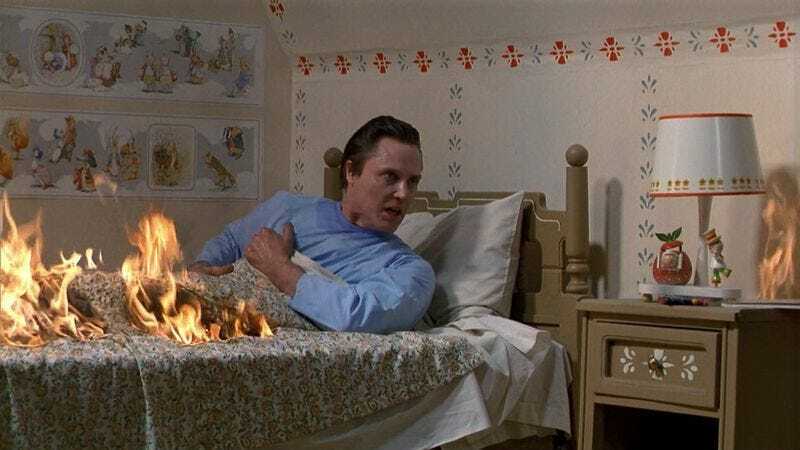 Cronenberg’s icy directorial detachment lends The Dead Zone a haunting creepiness, greatly amplified by Walken, whose halting verbal rhythms and glassy stare imbue Johnny with an alienated (if not outright alien) quality. His resurrection laced with biblical connotations, Johnny eventually helps the police solve a serial-killer case; he also reconnects with Sarah, who, during his coma, got married and had a child. Without ever pressing its thematic concerns too strenuously, the film develops into a tale about mortality, and the decisions we make to give our fleeting lives purpose. Those issues are most fully wrestled with during the film’s final third, when Johnny comes into contact with a senatorial candidate named Stillson (Martin Sheen), and “sees” that the man’s election will result in global calamity. Considering the preceding story’s overarching aura of doom, it’s no surprise that tragedy inevitably ensues. Nonetheless, Cronenberg deftly finds a way to end his film as he began it: on a subtle, allegorical note of Christ-like grace. Availability: The Dead Zone is available on DVD, which can be obtained from Netflix or your local video store or library, and to rent or purchase the major digital outlets.